Geothermal HVAC Systems deliver space conditioning — home heating, cooling, as well as humidity control. They can also supply water heating — either to supplement or even replace traditional hot water heaters. 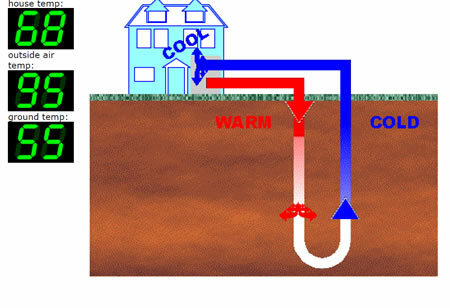 Geothermal Heating and Cooling Systems perform by transferring heat, instead of converting chemical energy to heat like in a furnace. Every Geothermal Heating and Cooling Systems has 3 main subsystems or parts: a geothermal heat pump to move heat between your building and the fluid in the earth connection, an earth connection for moving heat between its fluid and the earth, and a distribution subsystem for delivering heat or cooling to the building. Each system could also have a desuperheater to complement the building’s hot water heater, or a full-demand water heater to fulfill all of the building’s hot water requirements. Hi, just being curious. How deep is the pump below earth's surface? Thanks that I found this wonderful site like the site that I saw regarding on heating installation in Saskatoon. This post gave me perspective on the best way of installing new furnace. I thought before that installing a newly-purchased furnace is just fine. I am grateful that I read this article that gives more detail about installing a furnace. require, http://www.citygascompany.com can fulfill your request quickly and affordably. I recommend to install ac units at the end of summer. At that time it will not cost you much according to me.